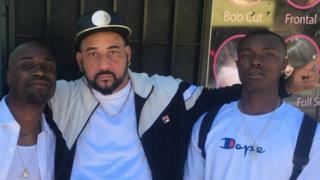 But Willie McCoy&apos;s family has pushed back, saying the aspiring rapper was not a threat to the officers as he was just waking up. "Any loss of life is a tragedy," police chief Andrew Bidou said in an updated report of the incident on Tuesday. Mr McCoy then woke up and looked at the officers, who commanded him to keep his hands visible. Police then say he did not comply and "quickly moved his hands downward for the firearm". "Fearing for their safety, six officers fired their duty weapons at the driver," the news release stated. Multiple rounds were fired in a span of four seconds. "Officers continued to yell commands at the driver and ultimately reached through the broken glass of the driver&apos;s window to unlock the vehicle." Mr McCoy&apos;s family has disputed this police account. During a vigil on Sunday, Mr McCoy&apos;s older brother Mark said police had surprised Mr McCoy and fired too quickly. "My little brother was just shot for no reason," he said, according to CBS News. "If I wake you up… if I knock on your front door and, &apos;Bang bang bang!&apos; you&apos;re going to jump off the bed," he said. "Why wouldn&apos;t you be safe while you wake him up and then [say] &apos;Driver, exit the car&apos;?" David Harrison, Mr McCoy&apos;s cousin, told the Los Angeles Times on Monday that Mr McCoy was raised by relatives after his parents passed away when he was a child. "I want no other parents, no other kid&apos;s parents, to go through this ever again," Mr Harrison said. "They can&apos;t just keep killing us in the street like this. My little cousin was asleep in the car." Mr McCoy&apos;s family has hired civil rights attorney John Burris - who recently took on a case where a homeless man sleeping in Oakland was killed by police - to represent them, the San Francisco Chronicle reported. Published on Wed, 13 Feb 2019 16:10:21 GMT, © All rights reserved by the publisher.